ఆస్పరాగస్' (Asparagus) is a genus in the plant family Asparagaceae, subfamily Asparagoideae. It comprises up to 300 species. Most are evergreen long-lived perennial plants growing from the understory as lianas, bushes or climbing plants. The best-known species is the edible Asparagus officinalis, commonly referred to as just asparagus. Other members of the genus are grown as ornamental plants. Asparagus cochinchinensis - Tian men dong in Chinese. Asparagus fallax Esparraguera de monteverde. Macaronesian native flora. Asparagus nesiotes Esparraguera majorera. Macaronesian native flora. Asparagus pastorianus Esparraguera espinablanca. Macaronesian native flora. 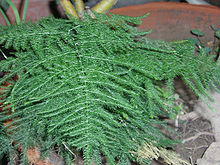 Asparagus Plumosus Nanus is a greenhouse variety, bearing fern-like foliage. Asparagus scoparius (Esparragón raboburro Macaronesian native flora. Asparagus umbellatus (Esparraguera común) Macaronesian native flora. ఈ పేజీలో చివరి మార్పు 3 జూన్ 2014న 20:52కు జరిగింది.